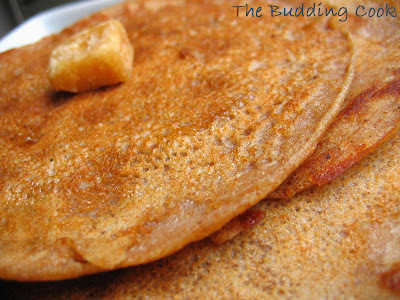 Vella dosas are sweet dosas made with jaggery and wheat flour. I understand that this is a very common tiffin item in Tamil Nadu. Melt the jaggery on medium heat in a cup of water till it dissolves completely. Let it cool. Mix all the other ingredients together. Add the jaggery syrup to this along with the required amount of water and prepare a batter. Heat a cast-iron skillet/griddle until hot and smear it with a little bit of ghee. Pour a ladleful of batter onto the skillet and spread in a circular motion starting from the inside, working your way towards the outside. Add a little ghee around the edges of the dosa and cook till golden brown. Then flip and cook the other side till done. Serve hot with or without accompaniments depending on your preference. We had our dosas with some spicy chutney to offset the sweetness of the jaggery. I have never had this one, that small piece of jaggery looks so cute there! hey, those look absolutely gorgeous :) lovely color. such a fav, but i never added coconut, will try that next time!! Dosas look great! I would have one with spicy chutney too :). TBC, so this is a sweet dosa? I like everything with jaggery..
Beautiful pictures and beautiful dosa TBC. Loved the idea of sweet dosa. It looks so good. Thanks for posting. I am going to try it. Have never heard of jaggery dosa's before. got to try this.. They look delicious. It is atleast 18yrs back i had them. wow..never tried this before. Mouthwatering pics. Sweet doas and spicy chutney sounds delicious. I make them minus rice flour...should try adding this now..Looks lovely! This looks good TBC,I had no idea they made this in TN..will try it sometime..
following the recipe of Meenakshi ammal of the popular cook and see(samaithu par) cookbook. The dosa was delicious! Looks biutiful. Adding this to my must try list. Thanx for sharing. Musical- yeah, I too needed something spicy to go along. I think that you are supposed to just have it with some ghee. But I don't like it like that. Please let me know if you do try it. Grihini, give it a go... u'll love it. Easycrafts- do let me know how it turns out for you. Kribha-try it when u can...very simple and does not require chopping of anything for a change! Namratha- I too had no idea... was trying to look up stuff for RCI and that's how this came about. Kalva, now that is again something new to me. Blogging teaches you a lot...you learn something new everyday! Wonderful! I found your blog through the comment on mine, and I love it. Your photographs are amazing - I hope you have entered/are entering the Click event! I've just blogrolled you - definitely worth repeat visits. Hight time you changed the name as TEC...instead of TBC!!! Wonderfully updated!! 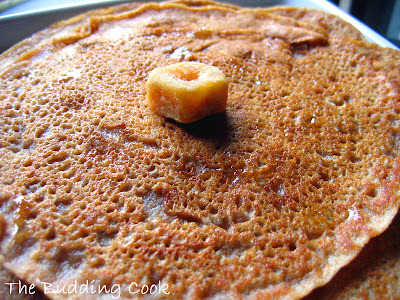 !Love love love this sweett dosa..Sure to be tried!! !i make the thicker batter version...Godambu/wheat ada with thenga and all...but not the tamil version..
See how many dishes you have tried and posted even from your freinds, down there! !Great great!!!! By the way waht does TEC stand for...did you ask me?? A sure winner you got there.... so warm and so inviting Dosai! Love those sweet dosas...am literally drooling. Wow looks fabulous. Never heard of this. 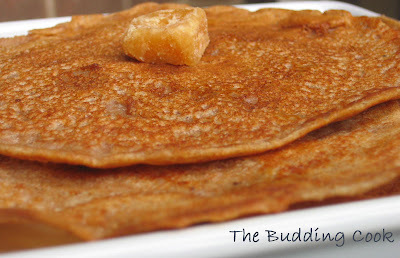 Jaggery dosa, nice recipe as jaggery is good in iron & helps in acidity & digestion. oh my god, you brought back lovely memories with this dish. When we were kids mom used to make this and my bro used to go gaga over it :). The only difference was she used to make it in a kadai, so the center used to have a small bump. Beautiful blog my dear and the pics are so wonderful. Wow, I've never heard of sweet dosa before. It looks very inviting. where do you source your jaggery from? This is something new to me. Will have to give it a try. this is a common tiffin item at our place too! !..easy, simple, delicious too...something u can come up with the least effort. Delicious ! as usual, whatever you cook is fab ! MEET THIS TOP WRITER OF THE PORTUGUESE LANGUAGE. Please, add it to your favourites. Yeah, it is rich in iron and is so much more better than sugar for you. Vini, thanks. Yes, thaat's how it is, isn't it?- food & memories. My husband has an aunt/ cousin & the only thing he remembers about her is the food he was served when he was at her place! I get my jaggery from one of the Indian stores here . It comes in tiny blocks. Dhivya, tomorrow has come and gone! Mona, thanks for visiting. Happy Ramadhan! They taste like pancakes but are without the eggs. Bindiya- awww, aren't you sweet! My mom used to make this one. Adding cashew powder sounds new to me. Noted down :) I know ,it will definitely add the to the taste. wow this looks delicious. I was looking for the recipe and came to ur site. Thanks for the recipe. hi, this looks great.. I make wheat dosa (without adding rice flour) using grated coconut ground with wheat flour, but adding jaggery sounds great. Will try this.